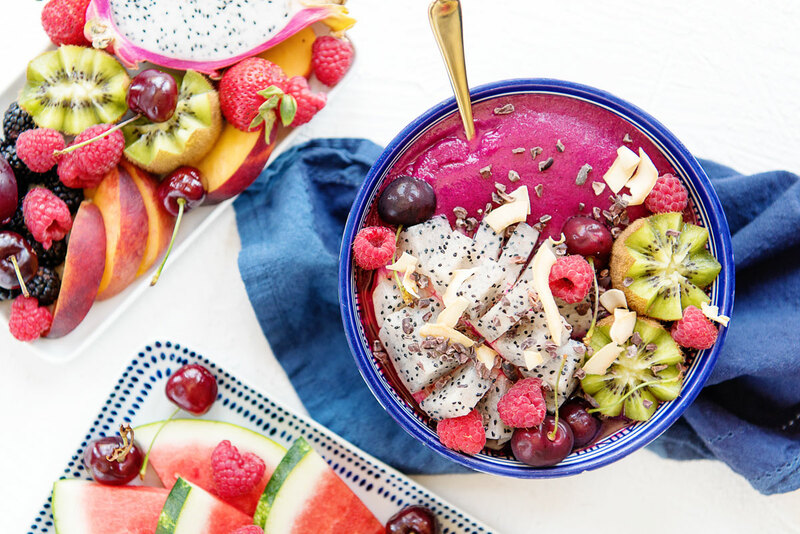 My favorite way to eat Pitaya is blended up in a bright pink smoothie bowl! 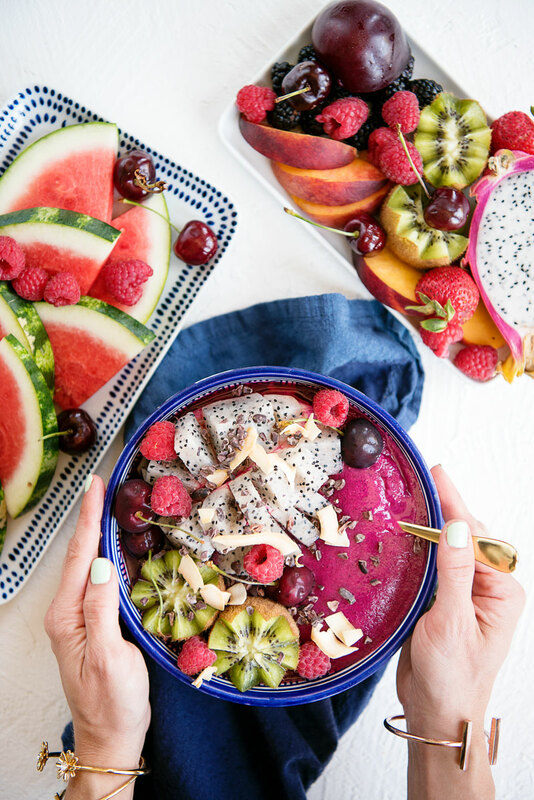 The easiest way to do this is to buy premade pitaya puree which thankfully is now available at many major grocery stores in the United States. Another fun way to eat it is as a whole fruit cut into cubes but still attached to the peel. 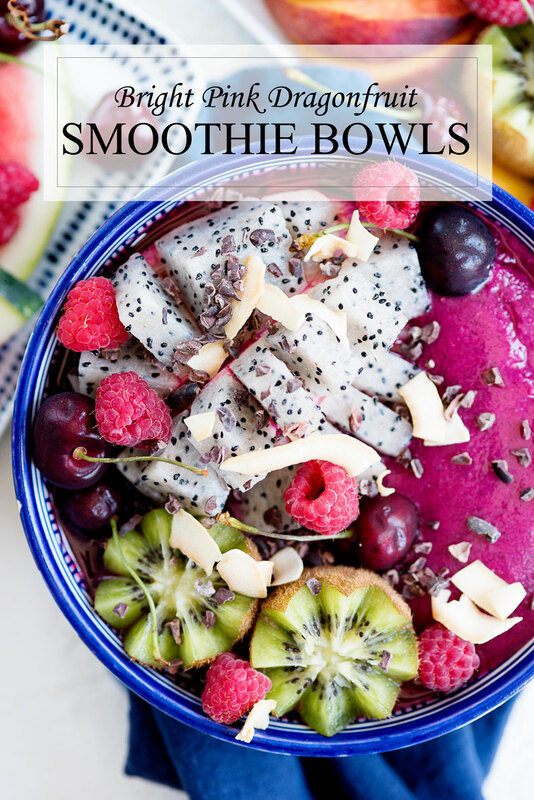 You can see an example of this in the smoothie bowl in these photos. The technique is super easy. Just slice the whole fruit in half lengthwise. Using a sharp knife, make 3-4 cuts the long way without cutting through the peel. Repeat the opposite direction. Press the peel in from the center to push the fruit inside out exposing the cubed fruit. Why isn’t my Pitaya or Dragonfruit Pink? Haha, excellent question and one I often ask myself! Unfortunately most of the dragonfruit that you find in the supermarket here in the United States are white in the center. There’s nothing wrong with your fruit! They are just a different variety. Before I figured this out, I actually wondered if the pitaya puree was dyed to give that vibrant pink color. It’s definitely not – that color is all natural. 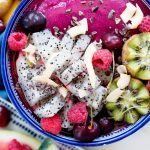 It’s not the first time I’ve said it, dragonfruit is a superfood! They are high in phytonutrients and antioxidants, and also contain some vitamin C and B vitamins. 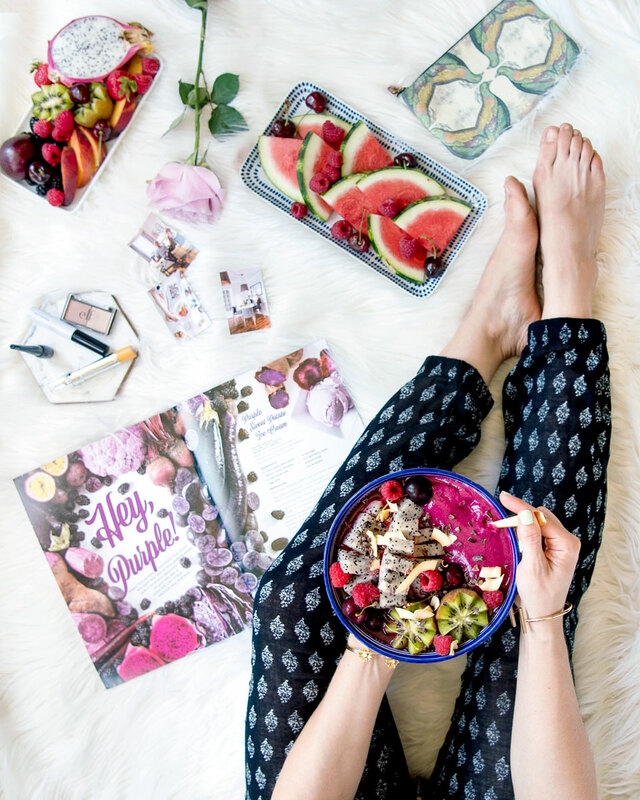 Phytonutrients are compounds that protect the plant from exposures that generate free radicals, like UV radiation and pests. The more we study them, the more we are learning about the beneficial anti-inflammatory results for us when we eat them. A dragonfruit is ripe when the flesh is an even pink color without any green patches. A few dark spots are normal, but if there are too many it’s a sign your fruit may be overripe. The skin should be firm but not hard. If the spiky points on the fruit are thick and pointy, the fruit is not ready to eat. Look for ‘wings’ that are dried and starting to wither. If you’re home and you cut open your fruit and see brown spots, don’t eat it – it’s definitely too ripe. 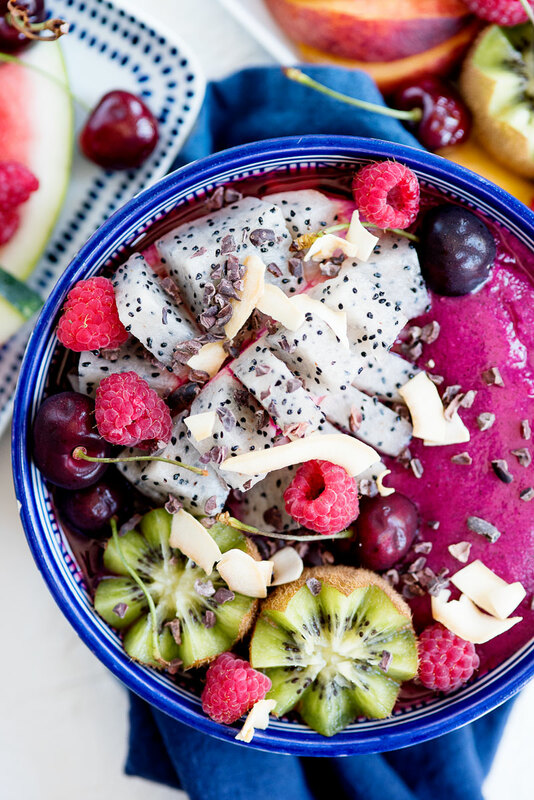 Combine dragonfruit puree, banana and orange juice in a blender and blend until smooth. 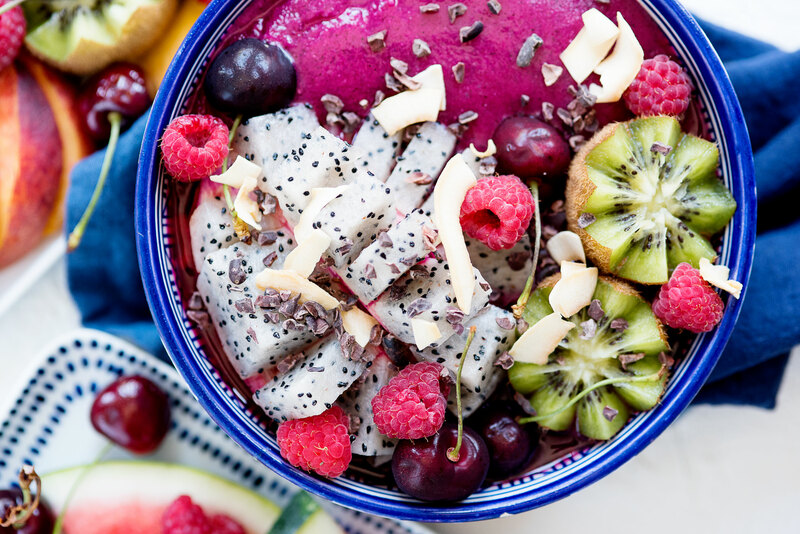 Top with fruit, cacao nibs and coconut flakes. 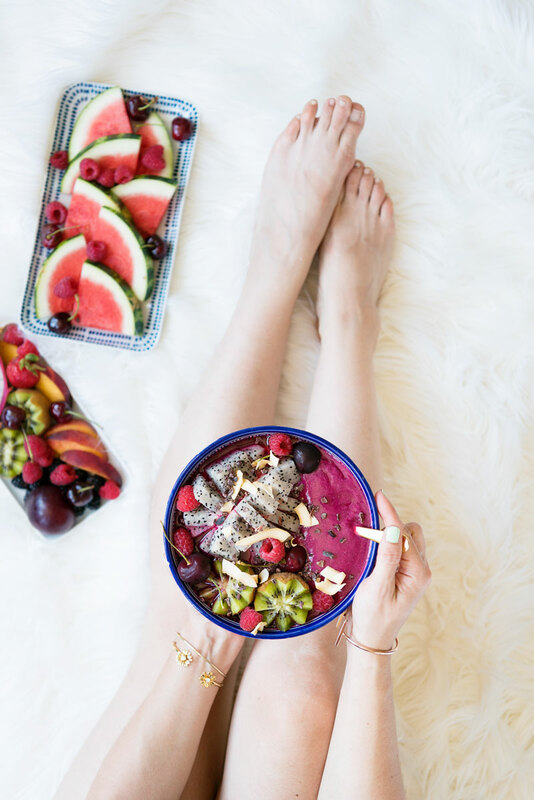 Nutrition information is for smoothie base only without added toppings.